48 degrees this morning, steam rising from the meadow, and I’m lured early by the rose garden, where yesterday we planted six new beauties. Six, because that’s all I could wedge into the car. Our local Witherspoon Rose Garden is having a sale so it’s a perfect moment to replace some of the puny ones that have hung on in this garden since the 1950’s. 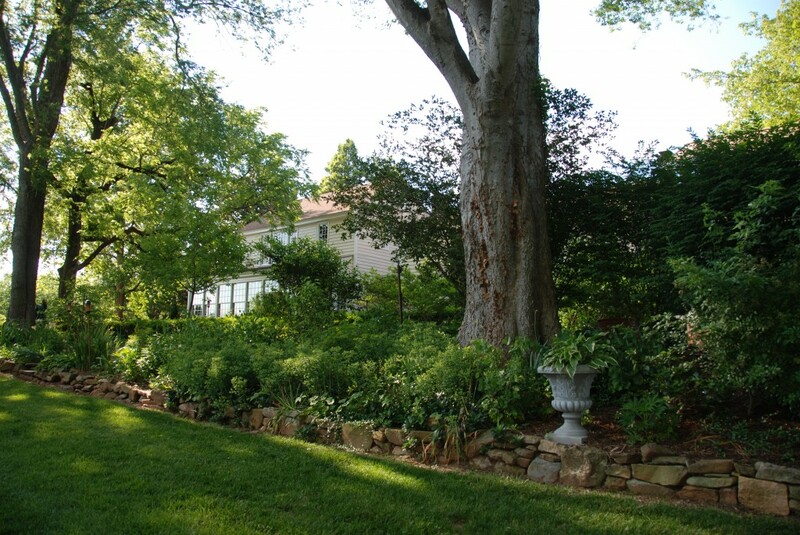 This garden I speak of is not in Tuscany but in North Carolina. 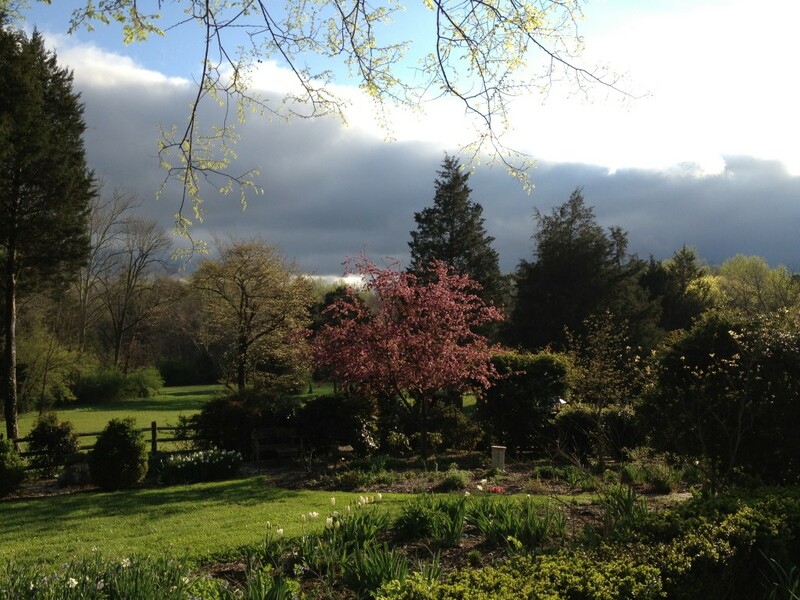 We changed our USA base in August and moved to Chatwood, an 1806 house with wonderful gardens that need a big shot of TLC, plus some redesigning. This was taken in spring, when my daughter lived here. It faces the meadow. The Eno River runs by the back. The photo above is the back of the house. That sunroom is where I plan to read and write all winter. At the end of A Year in the World, I wrote about a fantasy of moving to a yellow house–a traveler’s rest kind of place, where all the mementos of my journeys find a home and all the people I’ve met along the way can come and stay and cook. I imagined evenings of poetry readings and music. Sometimes fantasies swing around into reality–this farmhouse seems just the sort of place I dreamed of. In short, a home. Bachelard in The Poetics of Space says the good house is one that protects the dreamer. Many dreamers have lived here, since the house was built during the presidency of Thomas Jefferson. I hope they all felt protected. Moving proved to be more of a challenge than I remember. I think it’s like labor: you’re supposed to forget the pain so you’re willing to repeat the experience. Now the tons of books are unpacked, if not yet in alphabetical order, and everything is stowed somewhere. I think the snakes, possums, and mice have been exorcised from the basement. I think the gutters have been cured of their Niagara falls habits. 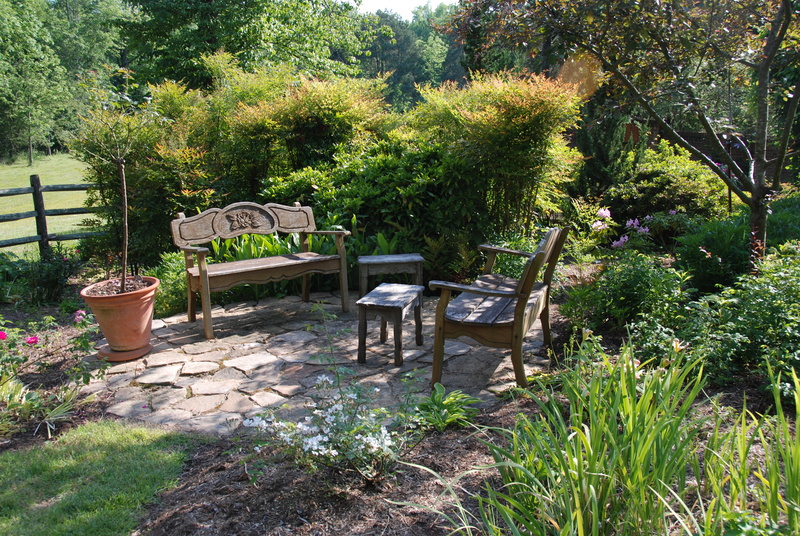 I have a couple of weeks to play in the garden before we decamp for Italy. The olive harvest beckons! Unpacking and placing books inevitably led to reacquainting myself with my library and to getting lost in a book now and then. And when I couldn’t face another box, I took to my bed with a book. I’ve enjoyed rereading Nabokov, Henry Miller, and Michael Ondaatje. What I also have taken time to do is revel in the summer vegetables and fruits. The raccoons and squirrels feasted on our garden, leaving us nothing except the jalapeñoes. Fortunately we have a farmer’s market to rely on. 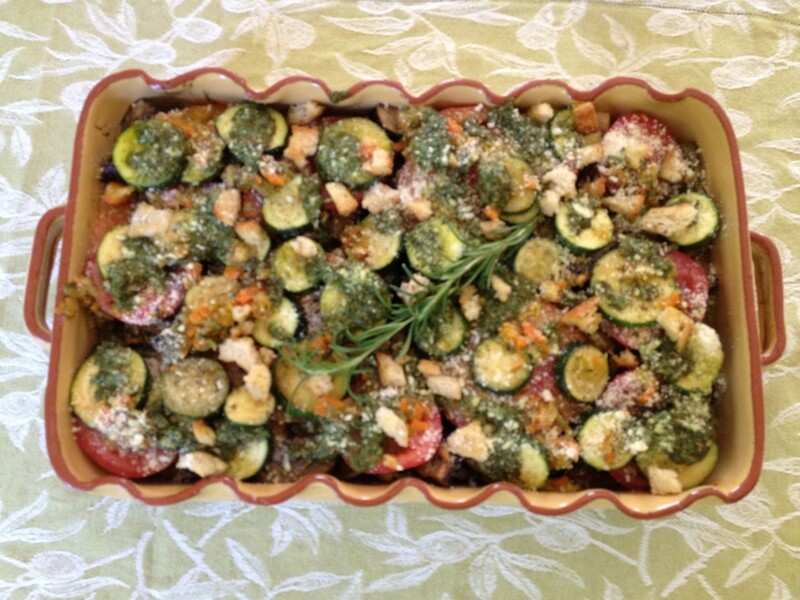 My favorite summer dish, hands down, is a multi-vegetable tian made with pesto and parmigiano. Sometimes one recipe comes to represent a moment in time and place, and this is it for the summer we moved. Woven into the preparation is the music I listened to over and over as I cooked: Bach’s concertos for unaccompanied cello, some of the most magnificent music every written. It seems to play on your own heart’s strings. I listened as I roasted eggplants and peppers, sautéed onions, zucchini and yellow squash, sliced wonderful tomatoes, then layered all these in a deep pie dish, adding a layer of fresh pesto and a layer of grated parmigiano. Some thyme, salt, pepper, crunchy breadcrumbs–there you have it. Just a twenty minute bake in a 350 degree oven. Love this, and the leftovers are just blissful on a focaccia sandwich. A bit blurry, I see. From my deep heritage as a southerner, I made several times a version of the yellow squash casserole I loved as a child. I make my own béchamel rather than use the canned mushroom soup my mother’s recipe lists. Frankly, I’m not really sure that mine is any better for all the updates. Here it is; one for us, one for my daughter’s family. Melted sunshine! Here are my favored crunch breadcrumbs again, some sautéed onions and some sharp cheddar and herbs. I lightly steam the squash, then combine everything with some béchamel and bake. This new/old house has electric ovens. I’ve always preferred them, though have put up with gas ovens for years. 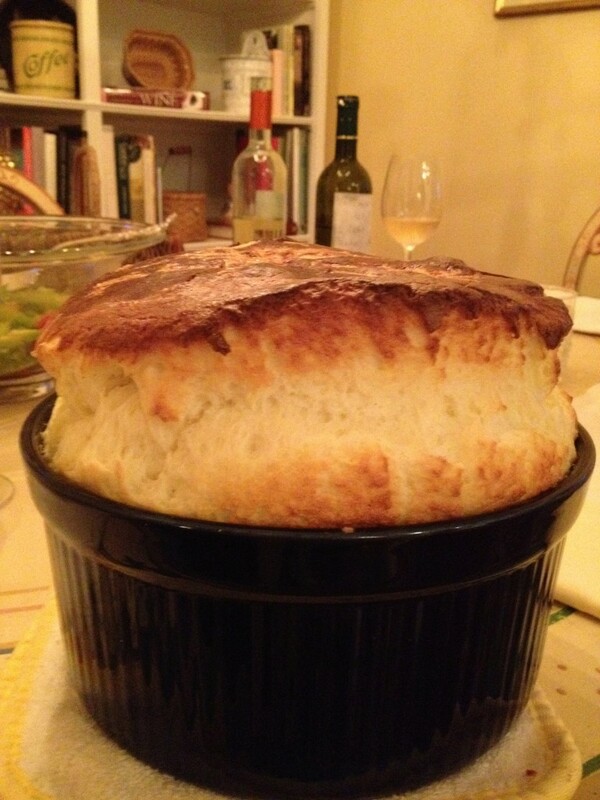 Ed was thrilled the first time he made a soufflé here. The top practically crashed the top of the oven! He’s made this Julie Child recipe for years–especially on Sunday nights–and knows it by heart. We do 1 1/2 times the recipe and there’s never a crusty morsel left in the dish. There’s a reason that panna cotta is Tuscany’s ubiquitous dessert. You can make it in five minutes, flavor it with vanilla or orange or lemon, and dress it up with berries or melted chocolate, or citrus. And it’s a bit glamorous. The recipe is in The Tuscan Sun Cookbook. Isn’t that pretty? I had a thing for tole trays for awhile and accumulated a dozen or so from eBay. I’m over it now but they are charming! We are thrilled to have our cookbook on hand in the kitchen. It saves us so much time searching through index cards and folders looking for our favorites. 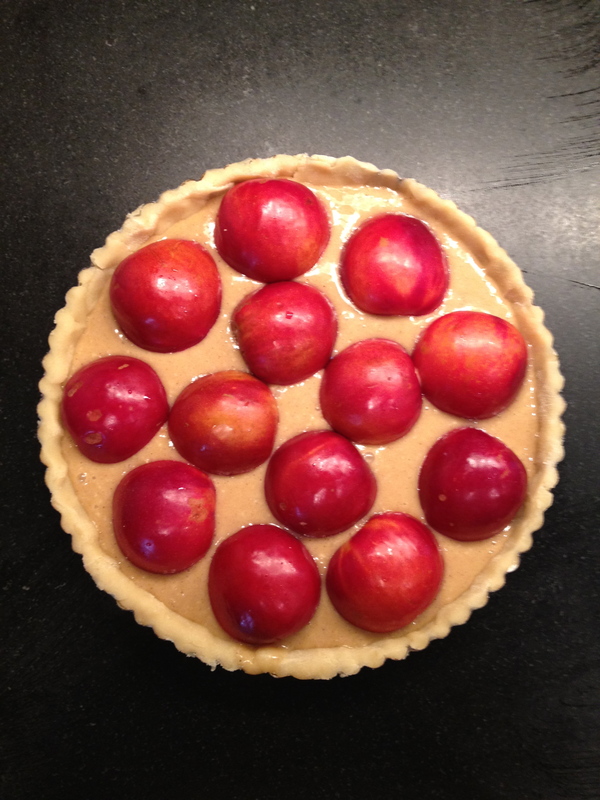 Not in the cookbook, but included in Bringing Tuscany Home, is Nancy Silverton’s Brown Butter Plum Tart. It is fall-out-of-your-chair good, and right now plums are just luscious. I like cooking with them especially because, unlike most fruits, they don’t need to be peeled. This tart is rich and juicy. The unlikely aspect is the butter. Not only do you melt it, you actually brown it until its nutty and smoking. Grazie, Nancy! I used a tart pan with a removable bottom. Here she is–ready for the oven. We served this to friends and fortunately there remained a slender slice for my breakfast! 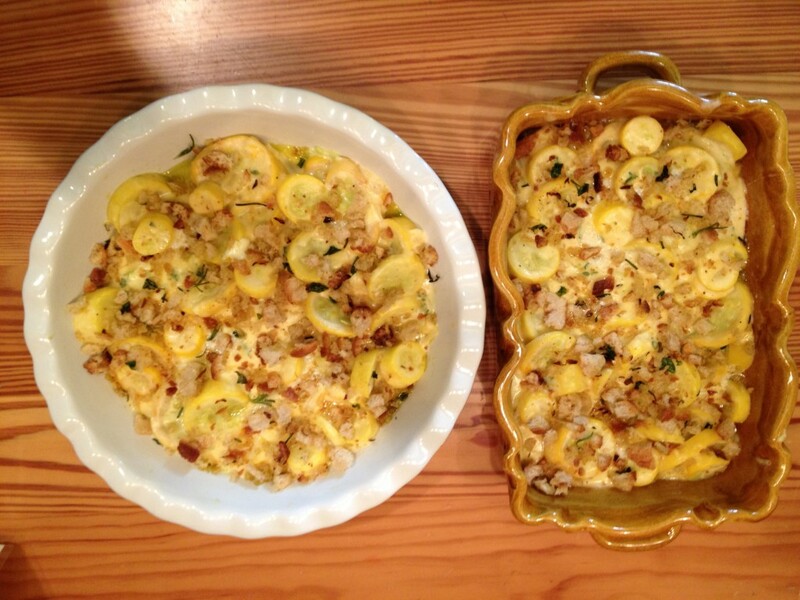 I would love to hear from you if you’ve cooked from The Tuscan Sun Cookbook! 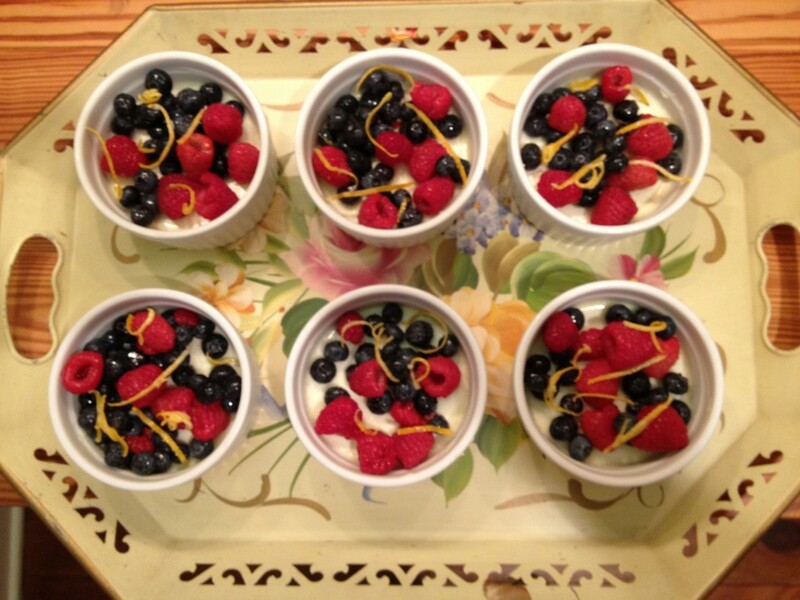 It’s fun to hear readers’ variations on the recipes. I am happy to be back on my blog. A curse on the jerk who hacked! My next post will be from Italy. Hope everyone has a smooth transition into a delicious, eventful, gorgeous fall.